Well I'm back with another MathHammer article! I was putting together my new set of Thunderwolf cavalry, and i was wondering which would be the best special weapon for the pack to take. 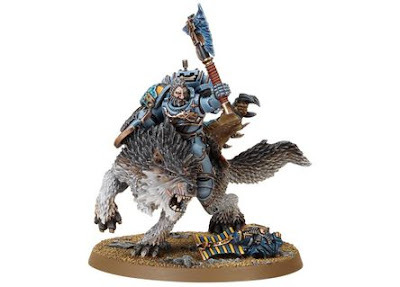 A power fist is an appealing choice with 4 S10 attacks, but I really think that the Space Wolves look much better with an axe (which also gains an extra attack). So, which is the best weapon? Read on to find out! This table shows a summary of the expected number of wounds caused by each weapon against different enemies. The 4+ represents an IG stormtrooper (WS/T 3), and the 3+ is a Space marine. I was pretty surprised that the frost axe actually comes out on top in every category due to their high strength, low AP, and extra attack (it like having 5 plasma gun attacks in close combat!). This would obviously make me lean toward the frost axe, however, this is just raw MathHammer, and there are a few other things to consider. First, the power fist and the axes strike at initiative one. This is an important consideration depending on what initiative the enemy is, and their ability to kill the Thunderwolves before they strike. Another thing to consider is that the power fist is strength 10 which is awesome! This allows you to insta-kill anything up to T5 and makes it auto-penetrate most vehicles. However, against single wound models with low toughness (which is what they will be facing most of the time) the frost axe is better due to it's extra attack. Now the calcuations in the first table don't apply if the thunderwolf has a storm shield, and loses it's extra attack. The table above shows what would change if it had a storm shield. The power fist comes up on top for anything with 2+ armour and high toughness enemies, and the wolf claw is best for anything with a 3+ save of worse. So this should help you to decide on what weapons to use. But it will come down to how you plan on using them (and also the points cost). Since I wouldn't suggest charging a Dreadknight or a squad of terminators with these guys, AP2 may not be that important. Personally I will give my thunderwolf a frost axe since I think it is the coolest, but if I give him a storm shield, maybe I'll replace it with a power fist (or thunder hammer for the concussive rule). And as an added bonus, here are the calculations as they apply to a wolf guard (Remember that if you give them a storm shield, or terminator armour, they lose their extra attack with some of the weapons). So there you have it! Hope this was helpful to someone out there. I am really liking the 6th edition close combat AP. It really makes things more interesting, but it makes the choices a little less straightforward. Well I'm going to get back to putting my space wolves together. Thanks for reading! For the normal TW I really like the power fist, S10 is amazing! Yeah, it's pretty incredible having 4 S10 attacks! But it's nice to have the Frost Axe for the extra attack, and for the most part, you won't need any more than that. How can the wolf claw POSSIBLY be worse than the power sword? It's the same but can reroll misses or wounds! Also, does the chainsword include the fact that they are rending? I was looking for the same chart but with power lance included since it seems like a decent option ( mostly on the charge). 2013 Hobby Resolution and 2012 Recap.